A missing boy presumed dead for 20 years shows up at a murder scene – his DNA, that is – setting in motion a jigsaw puzzle of clues and the reunion of childhood friends whose lives were derailed by the mystery. You’ll be taking notes to navigate this intricate 10-part British crime thriller. The Five is the kind of show that requires a certain amount of patience while it skitters all over the place, at times too eagerly displaying a veritable kitchen sink of clues and leads. It also demands a fair share of suspension-of-disbelief, as there were moments I could hear my interior voice whispering, “Note to self: this police procedural bit doesn’t add up, right?” And yet. . . there’s something dazzling all the same about this 2016 British series that marks American mystery writer, Harlan Coben’s first foray into Television. The fine ensemble cast, led by Tom Cullen as Solicitor, Mark Wells (Cullen’s best known for the role of Tony Gillingham, the unsuccessful suitor to Lady Mary in Downton Abbey) comprises the present day adults who are re-assembled following a brutal, seemingly unconnected murder of a mysterious woman in a nearby hotel. Among the evidence collected at the scene is a band-aid containing the DNA of Mark’s younger brother, Jesse, who disappeared in the woods as a small boy, while he was supposedly in the care of his brother and their friends. The tragic disappearance of the child (and what the evidence later unfolded) has left lasting scars on the pals and their families, from which no real resolution has ever come. The detective investigating the case, Danny Kenwood (O-T Fagbenle from HULU’s The Handmaid’s Tale) is one of the friends, whose own father was one of the cops who investigated Jesse’s disappearance when it happened. Danny finds himself in the unenviable position of having to re-open old wounds to try and get to the bottom of this mystery, while vacillating between holding his friends at bay and accepting their stubborn insistence of aid in solving the case. So the past has risen to taunt them with the possibility that Jesse may still be alive, but if so, who has he become? And what has he done? Director, Mark Tonderai, who directed all 10 episodes of The Five for StudioCanal’s Red Production Company, successfully kept the pacing and the visual style on par with the rapid ins and outs of a dynamic script that seemed to be in a constant state of shape-shifting. Just when you think it’s a classic missing child trope, it becomes something so much more sinister and complex. Throw in the sideline subplots and it can get more than a bit dizzying, especially when you realize that – eventually – most if not all of this has to somehow piece together at the end. Top that off with the bizarre break in normal police protocol in which you have not one but three private citizens throwing themselves into harm’s way by playing amateur sleuths, and tons of evidence that may or may not be allowed in court, and you get the picture. What I found compelling and reason enough to stay with this labyrinthine show was the smart and sardonic script, a visually exciting pace and suspenseful atmosphere, as well as the exceptional caliber of ensemble performance. In particular, the sense of regret and remorse exhibited in the performance of the great Geraldine James as Mark and Jesse’s mother. As well as Tom Cullen’s portrayal of the big brother who let his little brother be taken, and how that guilt follows someone their entire life, informing their adulthood in ways they can’t even begin to decipher. The twist ending is worth the wait, and although some will find it sentimental and contrived, you’d do well to keep a Kleenex or two around, just in case. 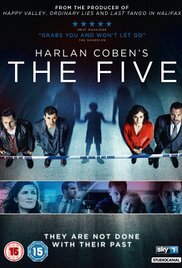 The Five is presently streaming on Netflix.